The international community -- including some Israeli pols, American Jews and the media -- are pushing hard. The Obama administration isn't making things any easier. http://www.JewishWorldReview.com | Over the past several years, a growing number of patriotic Israelis have begun to despair. We can't stand up to the whole world, they say. At the end of the day we will have to give in and surrender most of the land or all of the land we took control over in the 1967 Six Day War. The world won't accept anything less. These statements have grown more strident in the wake of the slaughter of the Fogel family last Friday night in Itamar. For example on Thursday Ari Shavit , a columnist for Israel's equivalent of the New York Times, Ha'aretz, called Israeli communities built beyond the 1949 armistice line the local equivalent of Japan's nuclear reactors. Like the reactors, he wrote, they seemed like a good idea at the time. But they have become our undoing. The international community's response to the Palestinian atrocity in Itamar is pointed to as proof of that Israel must surrender. Instead of considering what the savage murder of an Israeli family tells us about the nature of Palestinian society, the world media have turned the massacre of the Fogel family into a story about "settlements." Take the Los Angeles Times' for example From the Times' perspective the Fogels were not Israeli civilians. They were "Jewish settlers." They weren't murdered in their home. They were killed in their "tightly guarded compound." And, in the end, the Times effectively justified the murder of the Fogel children when it helpfully added, "Most of the international community… views Israel's settlements as illegal." The Times' report was actually comparatively sympathetic. At least it mentioned the murders. Most European papers began their coverage with Prime Minister Binyamin Netanyahu's announcement that the government will permit Israelis to build 400 homes in Judea and Samaria. As for the governments of the world, most were far swifter and more aggressive in their condemnation of Netanyahu's announcement of the building permits than they were in their condemnation of the murders. According to New York's Jewish Week, there is a new consensus in the American Jewish community that imposing an economic boycott on Israeli communities outside the 1949 armistice lines is a legitimate position. 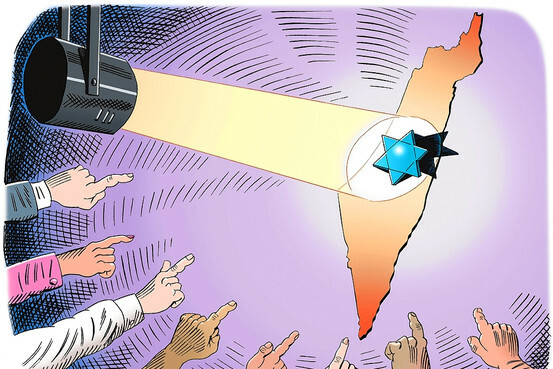 The paper interviewed Martin Raffel, the head of the new Israel Action Network, a multimillion dollar effort by the Jewish Federations of North America and other major Jewish groups to counter the delegitimization of Israel. Raffel called the boycott movement misguided, rather than wrong. Then he justified it by arguing, "Being misguided in one's policies doesn't mean one necessarily has become part of the ranks of the delegitimizers." If that wasn't enough, Ron Kampeas, the Jewish Telegraphic Agency's Washington bureau chief wrote Tuesday that we shouldn't rush to conclude that Palestinians carried out the attack. Kampeas wrote, "We do not yet know who committed the awful butchery in Itamar over the weekend." With American Jews taking a lead role in delegitimizing Israel and flacking for Palestinian terrorists; with the international media ignoring the massacre of the Fogel family and attacking Israel for its response to the event they didn't cover; and with the US government united with the nations of the world in condemning the government's decision to allow Israelis who are Jewish to build on land they own, the despair of a growing chorus of Israelis is understandable. The first problem with this view is that it confuses the focus of Palestinian and international attacks on Israel with the rationale behind those attacks. This is a mistake Israelis have made repeatedly since the establishment of the Fatah-led PA in 1994. Immediately after the PA was set up and IDF forces transferred security control over Palestinian cities and towns in Judea and Samaria to Yassir Arafat's armies, Palestinian terrorists began attacking Israeli motorists driving through PA-controlled areas with rocks, pipe bombs and bullets. Then prime minister and defense minister Yitzhak Rabin blamed the attacks on "friction." If the Palestinians didn't have contact with Israeli motorists then they wouldn't attack them. So Israel built the bypass roads around the Palestinian towns and cities to prevent friction. For its efforts, the Palestinians and the international community accused Israel of building "Jews-only, apartheid roads." Moreover, Palestinian terrorists left their towns and cities and stoned, bombed and shot at Israeli motorists on the bypass roads. Then there was Gaza. When in 2001 Palestinians first began shelling the Israeli communities in Gaza and the Western Negev with mortars and rockets, we were told they were attacking because of Israel's presence in Gaza. When the IDF took action to defend the country from mortar and rocket attacks, Israel was accused of committing war crimes. The likes of Shavit said then that if Israel left Gaza the Palestinian attacks would stop. They said that if they didn't stop and the IDF was forced to take action, the world would support Israel. Shavit himself engaged in shocking demonization of the Israelis living in Gaza. In May 2004 he wrote that they were undeserving of IDF protection and that no soldier should defend them because they weren't real Israelis. As for the international community, not only did it continue blaming Israel for Palestinian terrorism. It refused to accept that Israel ended its so-called occupation of Gaza. It has condemned every step Israel has taken to defend itself from Palestinian aggression since the withdrawal as a war crime. The lessons of these experiences prove is that Israeli towns and villages in Judea and Samaria and Israeli are not castigated as "illegitimate" because there is anything inherently illegitimate about them. Like the bypass roads and the Israeli presence in Gaza, they are singled out because those interested in attacking Israel militarily or politically think are an easy target. If Israel is convinced that it has no choice but to bow to these people's demands, they will not be appeased. They will simply move on to the next easy target. Israeli Jewish communities in the Galilee and the Negev, Jaffa and Lod will be deemed illegitimate. In a bid to pretend that the communities in Judea and Samaria are somehow different from communities in the Galilee, proponents of surrender point to the non-binding 2004 International Court of Justice opinion that the communities in Judea and Samaria are illegal. Israel's bitter experience proves incontrovertibly that bowing to international pressure just invites more pressure. The first thing we must do is recognize that legitimacy is indivisible. In the eyes of Israel's enemies there is no difference between Itamar and Maaleh Adumim on the one hand and Ramle and Tel Aviv on the other hand. And so we must make no distinction between them. Just as law abiding citizens are permitted to build homes in Ramle and Tel Aviv so they must be permitted to build in Itamar and Maaleh Adumim. If Israel's assertion of its sovereignty is legitimate in Tel Aviv, then it is legitimate in Judea and Samaria. We cannot accept that one has a different status from the other. Likewise, it is an act of economic warfare to boycott Israeli products whether they are made in Haifa or Mishor Adumim. Anyone who says it is permissible to boycott Mishor Adumim is engaging in economic warfare against Haifa. Once we understand that Israel's legitimacy is indivisible we need to take actions that will put the Palestinians and their international supporters on the defensive. There are any number of moves Israel can make in this vein. Two days after the massacre in Itamar, the PA dedicated a public square in el Bireh to terror commander Dalal Mughrabi. Mughrabi commanded the 1978 bus attack on the coastal highway in which 37 Israelis - including 12 children were murdered. The PA previously named a street, a dormitory, a summer camp and a sports tournament after her. Several popular songs have been written to glorify her crimes. The US is underwriting the PA's budget. This should stop. Were the government to go after international aid to the PA, not only would it begin a debate in the US and perhaps Europe about the nature of Fatah specifically and Palestinian society generally, it would force the Palestinians' myriad supporters to justify their support for a society that is defined by its goal of annihilating Israel. And whether defying our foes is hard or easy, it is our only chance at survival. Either all of Israel is legitimate or none of it is.